Shipping weight is calculated using physical product dimensions. Z-MAX 6A UTP patch panels harness unprecedented performance and reliability in a high-density modular solution. 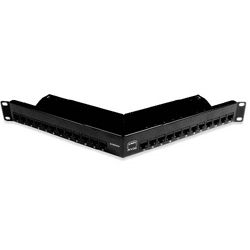 These complete patch panel kits combine 19 inch patch panels with Z-MAX 6A panel outlets to offer the industry’s highest performing category 6A patching solution. Dimensions: 4.30”x 19.00” x 1.74'"